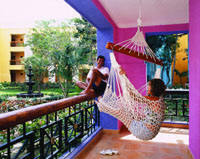 Iberostar Paraiso Maya won the Crystal Award for "Best Staff and Service" from Apple Vacations in 2005. BOOK YOUR Iberostar Paraiso Maya VACATION ONLINE TODAY! 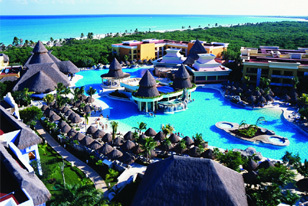 Iberostar Paraiso Maya Hotel - a Majestic 5-Star Experience! Iberostar Hotels and Resorts hold the distinctive honor of being selected "Best Hotel Chain" four years in a row by Apple vacationers! Stay at an Iberostar Resort and you'll immediately see why. 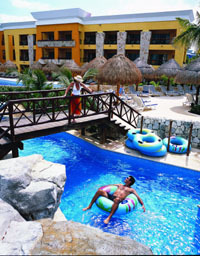 Iberostar Paraiso Maya Hotel Highly recognized by ecstatic vacationers as one of the best All-Inclusive resorts. Paraiso means paradise and that is located 10 minutes north of Playa del Carmen on 3/4 mile stretch of beach. A slice of eden in flourishing gardens with a never ending pool; weaving through the contours of the resort like a tropical lagoon, integrating pools and creating a fantasy kids will love! Four fabulous specialty restaurants are connected by walkways over lagoons near the open-air lobby. The main dining room has buffets offering delectable choices, including pizza- ideal for the picky little eaters. Past vacationers have rated Iberostar as "Excellent" on food and beverage and dining services. 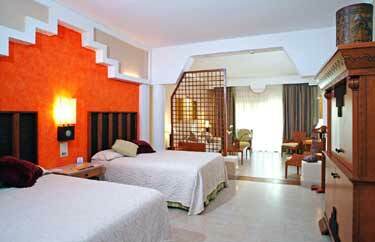 In fact, feedback on all aspects of this resort rank Iberostar as most outstanding All-Inclusive and worthy of the Crystal Award Best All-Inclusive Chain for 3 consecutive years. Nestled amid lush gardens, the accommodations at Iberostar Paraiso Maya are situated in quaint buildings designed to replicate a charming Mexican village, complete with a courtyard. The design creates the feel of a small inn with all the amenities and luxuries of a big resort. Each of the 432 elegant suites and two presidential suites offer cable TV, A/C, ceiling fan, in-room safe, complimentary mini-bar, coffee-machines, DVD player, iron, clock and a balcony or terrace/ Rooms are available with either two double beds or one king bed. Each room features a private bathroom complete with bathtub, hairdryer, lighted cosmetic mirror and phone. Rooms include cable television, air conditioning, ceiling fan, in room safe, complimentary mini-bar, coffee machines, dvd players, iron, clock, private bathroom with bathtub, hairdryer, lighted cosmetic mirror, phone, and a balcony or terrace. Rooms include separate seating area, cable television, air conditioning, ceiling fan, in room safe, complimentary mini-bar, coffee machines, dvd players, iron, clock, private bathroom with jacuzzi style bathtub, hairdryer, lighted cosmetic mirror, phone, and a balcony or terrace. The beachfront complex is perfectly integrated into the tropical landscape. 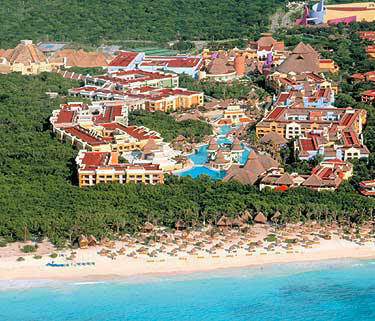 It consists of the Iberostar Paraiso Maya and the Iberostar Paraiso Beach. The Shared amenities include an attractive lobby and main restaurant (with show cooking). The complex has 7 restaurants, including 6 specialty restaurants, a pool bar and 9 more bars. Night club, discotheque. Imaginatively-designed pool area with separate children’s pool and extensive sunbathing area (sun loungers, parasols and towels free of charge). Also shops, supermarket and hairdresser’s. Access to the Internet for an extra charge. Aerobics, exercises, table tennis, volleyball, water polo. Tennis court with flood light, catamaran-sailing, windsurfing. Diving taster courses in the pool, bicycle excursions, rifle shooting and archery. Water sports 1 hour each per day. An extra charge is payable for motorized water sports. Varied entertainment during the day and in the evening. Miniclub (ages 4 - 12) during the day. Evening Activities: Nightly entertainment with a live band and professional dancers, Weekly Theme Parties, Theater Bar and Night Club. Lucy`s Kid`s Club offers supervised activities from 10:00 am to 6:00 pm, plus there is a children`s pool and kiddie disco at night. 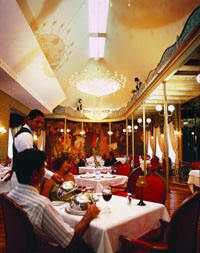 * Gourmet Restaurant - A la carte dining, offering French specialties for dinner only. * Restaurant Japanese Tepanyaki - Specialty restaurant serving dinner only. * Steak House - A la carte specialty restaurant serving dinner only. * International Buffet Restaurant - Main restaurant serving breakfast and lunch. Stay At One, Play At All - Guests staying at the Iberostar Paraiso Maya can enjoy Dine Around options - Access to all bars and restaurants at Iberostar Paraiso Beach, Paraiso del Mar, and Iberostar Paraiso Lindo. Iberostar Rose Hall Beach - NOW OPEN! Copyright © 2002 Page Concepts. All rights reserved.